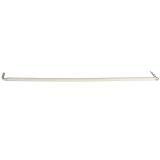 Width: 41" - from the outside of the eye loop to the outside of the eye loop and 38" - gate itself. Hot-dip galvanized to improve appearance and longevity. 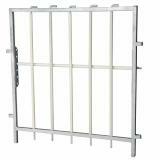 Comes with 1 horizontal bar and 5 vertical rods. As shown above in photo, vertical bars are spaced 6" apart. 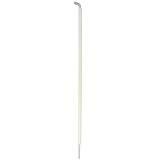 One horizontal bar—1/2" diameter steel rod with white plastic roller. 6 height possibilities (18" to 28" with increments of 1" to 2"). Held in place with a spring-loaded clip. 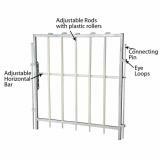 Eye loops—Two eye loops at ends allow attachment with a Connecting Pin (sold separately); to wire panels, metal bar gates and/or wooden panels. 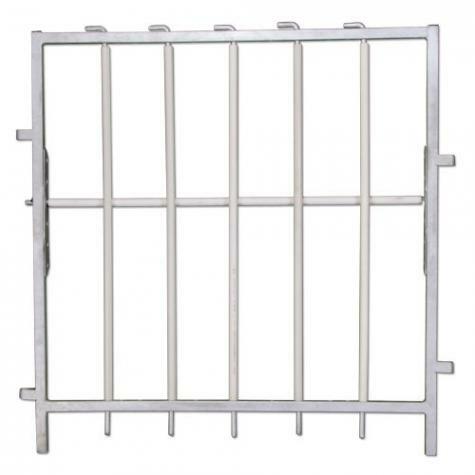 Can be attached to our PowerBilt® or Welded Wire Panels. 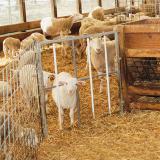 Hot-dip galvanized products have triple the useful life in humid, acidic climates (many barns!). 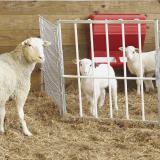 Both horizontal and vertical internal bars can be altered to allow the openings to "grow" with the lambs or kids. 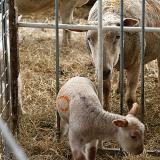 White plastic pipe on rods spin freely when lambs move through them. To connect to panels, etc: Use Connecting Pin and Eyebolt. Recommended: 27 out of 28 said they would recommend this product to a friend. 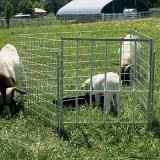 Very durable creep gate that is great for keeping mature goats out of the creep feeder. 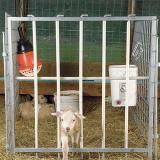 I would like more holes for width adjustment to keep out yearlings while still allowing nursing kids access to the creep feeder. We modified one of our creep gates with a 2" board on each outside opening with the rest of the vertical bars at their smallest spacing, which works quite well. Really well made and adjusts to meet all my needs. Very nice. 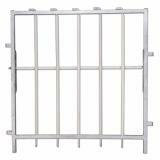 This is a great creep gate, very sturdy heavy metal. 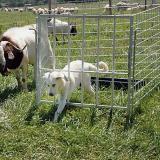 Our larger goats have tried to get threw it to no avail and it has held up to their attemps.